ATN NVMPAN143A NVM14-3A Night Vision Monocular FREE SHIPPING! 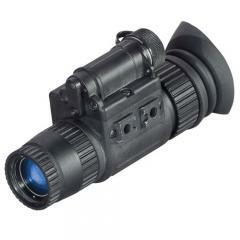 The ATN NVM14-3A is a third-generation night vision monocular. It is highly versatile, supporting handheld use, head or helmet mounting as well as tactical weapon mounting. It is compatible with most IR lasers and can also be adapted for use with a standard digital camera or cellphone. The multi-coated objective lens and powerful intensifier tube provide excellent light amplification and clarity in low-light conditions. The built-in infrared illuminator allows the monocular to produce clear images, even with zero ambient light. Automatic brightness adjustments ensure a consistent image regardless of ambient light, while a bright light cut-off feature automatically shuts the device down after ten seconds to protect the intensifier from exposure to too-bright light. Digital controls are incredibly user-friendly, while the included battery and excessive brightness indicators in the viewfinder allow for convenient tracking of status during use. ©2002-2019 CopsPlus.com: ATN NVMPAN143A NVM14-3A Night Vision Monocular FREE SHIPPING!